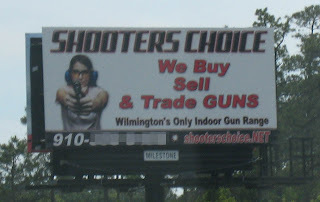 Leaving Topsail Island, one of the first signs you'll see is for Shooter's Choice, a gun seller and shooting range located just south in Wilmington. This picture is a little blurry, since I took it while driving by in the car. Nothing says "Thank you for visiting, and please come again" more than a giant picture of someone pointing a gun directly at you.